Uber is showing that it’s not resting on its laurels when it comes to becoming the leader in on-demand navigation – the company has just hired Nasa aircraft engineer Mark Moore to head up engineering at its Uber Elevate arm. 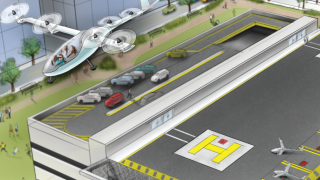 That flying Uber car could be on route. Back in 2010 Moore wrote a paper on the feasibility of creating and using vertical take-off and landing (VTOL) vehicles for short-haul urban journeys. Following the publication of his paper, Bloomberg reports Moore went on to consult on Uber’s own more recent white paper on the subject. This isn’t the first time, then, that Moore has been connected with Uber’s ambitions in the area of VTOL craft. In fact, Moore said he’d been impressed with Uber’s vision, and believed the company actually had a practical business case for making his original vision real. Not only that, Uber has the market power to make it happen. In its own paper Uber outlined the idea of using VTOL craft to create an on-demand aviation service for travel within and between cities. This would involve creating a small fleet of electrically powered VTOL aircraft which would be able to travel around 50 to 100 miles on a single charge. Though the aircraft would probably be initially manned by human pilots, the overall goal would be to make the vehicles autonomous and able to be summoned via a smartphone app. Uber’s hope for the service would be to cut down commute times, and perhaps even undercut the overall cost of owning a car for some. Uber isn’t the only company interested in developing VTOL technology for business purposes, and any kind of Uber Elevate service is a long way from becoming a reality. We can't even begin to fathom the legal and infrastructure changes that are going to be required to clear such ventures for take-off. That said, it’s clear that Uber is actively pursuing the technology with this hire, and that’s the best way to ensure it becomes a reality sooner rather than later.